What was the Great One like as a kid? 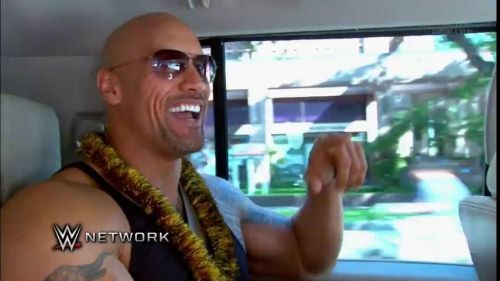 The Rock is well-known for his antics in the ring. He got away with saying way more than any WWE Superstar should have back in the day and he had a lot of fun in the process. But Dwayne Johnson recently revealed on WWE Network's Stroy Time that his childhood was just as unruly as his later years in the ring. The Rock was one of WWE's first-ever third-generation Superstars and he more than lived up to that title. He electrified audiences all over the world during his time with WWE, but when he was finished in the ring, he took his talent to the big screen where he continues to dominate. As awesome as The Rock might be nowadays, there was a time when he was a kid full of trouble. Depending on who you ask from the Fast And The Furious cast, The Rock might still be a little bit of a pot-stirrer. The Rock recently sat down with WWE Network's Story Time when he revealed as a child he liked to throw things out of his parents' sixteenth-floor apartment. This dangerous activity claimed at least one very heavy typewriter, but the story got even better when The Rock revealed there was a cinema across the street. The Great One said he liked to turn off all the lights in the apartment and fling eggs at patrons in line to get into the movie theatre on Friday nights. The Rock was a handful since he was eight-years-old, which made his mindset a perfect fit for WWE's Attitude Era. The Rock will keep making tons of movies, television shows, and other projects with Seven Bucks Productions. But he'll probably stay away from throwing any eggs from this point on because it would probably make some headlines if someone got blasted with an egg only to look up and see Dwayne Johnson hurling produce at them. This is a great story but it's also a crime and nobody should throw eggs at people. After all, it landed Justin Bieber in a lot of trouble when he took on the old-school hooligan behaviour. But it was certainly an entertaining story to hear from The Rock.